Quality Food Awards 2017. High in fibre. High source of omega-3 fatty acids. Source of protein. 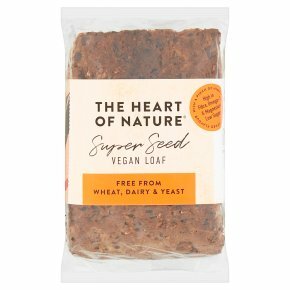 Sugar free.The Heart of Nature We believe, it is the world's healthiest bread, baked without flour or yeast. It is an ultimate source of nutrients and minerals, imperative for optimum healthy lifestyle. By upping your energy, slowing down ageing processes and boosting immunity improves lives dramatically. Himalayan salt is added to enrich its unique, delicious flavours and support essential minerals benefits. "Perfect & simple food is the key to real happiness"
Tip: The appropriate storing will extend the shelf-life and the freshness of the bread considerably.